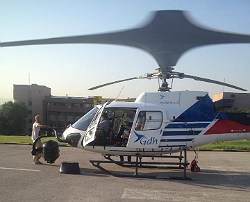 Turkey, August 2014: The inauguration of Turkey's first elected president, Recep Tayyip Erdogan, was broadcast live by TRT with ACTA Medya contributing to the seven hours of transmission by filming from a helicopter and motorcycles. The 25-kilometer journey from Recep Tayyip Erdogan’s house in Keçiören to Cankaya Mansion was broadcast in its entirety. 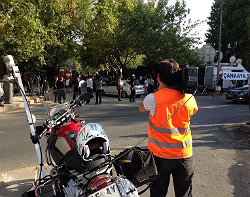 ACTA Medya produced the transmission of the motor convoy with a team of 40 members, two motorcycle cameras and one helicopter camera. The signal was transmitted via transfer stations that were set up on the TRT building and Dikmen hill. The production got the thumbs up from the audience and TRT management. 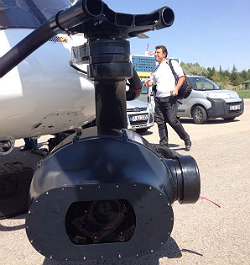 The live signal of TRT was broadcast by Turkish TV channels, as well as international TV channels and news agencies. The risk of signal dropout was minimized by means of coordination with the three helicopters that provided security for the convoy. The RF transmission that was produced by a purely Turkish team for the first time in Turkey got full marks from the authorities. 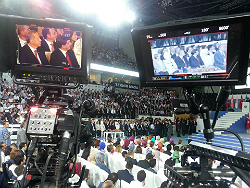 Meanwhile ACTA Medya provided special camera systems to TRT for the broadcast of the extraordinary general assembly of the ruling party AKP on 28 August. The spider cam that was installed on the ceiling broadcast the organization from different dimensions; one 4K and three 3D cameras were used. 4K and 3D shootings made history as the first Ultra HD and 3D recordings of Turkish President Recep Tayyip Erdogan and for the first time news content was shot by special cameras. ACTA Medya which has broadcast the Eurasia Marathon live for the last two years, has been the host broadcaster of organizations such as World Archery Championship and International Fetih Archery Championship. Being specialized in sports broadcasting, ACTA Medya has been a top provider of football and basketball league transmissions, and in August for the first time used three special cameras; High Speed, Super Slow Motion and Skycam at once in the same match.